Review! Last month, I was really in love with the Lodge theme. This month didn't impress me any less! I really love getting this box every month. I'm a candle hoarder and love trying and discovering new scents, plus, I love how each month is themed. It's like Christmas comes once a month! If you aren't familiar with Flicker Box, it's a subscription box that is delivered to you once a month, full of different candles! I also really love this because Flicker Box seeks out small shops and candle makers. You get a little information card filled with everything you could want to know about all the candles included in your box. Of course, I can never wait to start burning my new candles and incorporating them into my decor. This Cinnamon Cocoa Candle smelled just like yummy Hot Chocolate! I'm a chocolate lover so I really enjoyed this one! Also, it seems to be a Flicker Box exclusive! Just another reason to sign up for a box! Two Words. COCONUT. MANGO. I was so bummed this candle wasn't bigger because I AM OBSESSED. It smells so amazing! I'm a sucker for anything coconut and this is just perfection. I'm currently burning it in my bedroom and it's so relaxing and reminding me of those bright sunny beach days in Jamaica. Typically, I'm not a fan of floral scents.. but can we just talk about how amazing this combination is for a sec? I'm a sucker for anything that smells like, or reminds me of the ocean. AGAIN. I was blown away by this candle, I almost don't want to burn it because I'll be so sad when it's all gone! Overall, I was once again, impressed with the candles in my box this month! 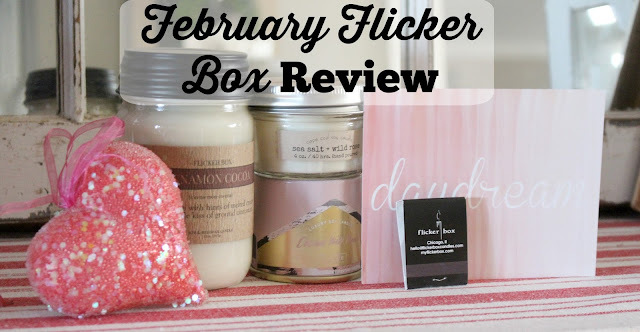 Flicker Box is a must subscription box for me! If you want to sign up for your own box, you can sign up here. I'd love to hear from you guys! What do you think about this box? If you signed up for Flicker Box, I'd love to hear about your experience! Shoot me a message below or on Instagram! The coconut mango sounds amazzzzing.